GPS is a manufacturer of custom printed security bags, cash bags, deposit bags, currency bags and evidence bags. We can also produce and supply your business with a wide variety of zipper anti-static bags. We have a full line of super-strong security bags which can be designed with customized for your business. Whether you are running a retail business that needs strong and safe bags for making your daily or weekly deposits, or part of the law enforcement community, having a high quality tamper evident security bag and currency bags is crucial to your operation. From police evidence to scientific sampling there is one irrefutable fact in any protocol – the initial security of the sample and subsequent chain of custody can have ramifications for years into the future. In fact the validity of the conclusions drawn from the sample may be tested against the very security method used to control the sample. Having a strong, high security bag is critical. Our self-sealing disposable currency bags and security bags are water and tear resistant and feature strong pouch seams. Why buy your security bags, deposit bags, evidence bags and currency bags from GPS? GPS custom made security deposit bags and currency bags are made of recyclable, strong, single or co-extruded polyethylene film to keep your goods safe and intact. Our currency bags also feature advanced security closure seam and void-indicating graphics and are fully customization. Self-sealing adhesive closures on our bags have security features that exceed bank requirements for levels of tampering evidence. Tamper-evident security bags makes it impossible to hide unauthorized entry. Approved by banks, casinos, and law enforcement agencies that require see-through to contents of the currency bags. 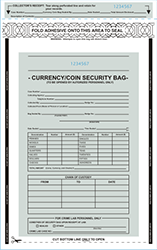 Each currency and security bag comes with the option of no-hassle, write-on surfaces. Use a marker or pen to label contents. Easy-to-follow forms can guarantee consistent labeling.